Just fifteen minutes from Port Douglas, Mossman is a country town nestled among towering mountain rainforests. Mossman is perhaps best known for the Mossman Gorge, with its delightful rainforest walk along the Mossman River (an easy 2.7 kilometres). Bring your bathers, as this is a superb spot for a swim. Dotted around Mossman are some truly beautiful accommodation options – secret rainforest homes tucked away in private valleys. Near Mossman, quiet beaches (Newell and Wonga are close by), golf courses, organic farms and some wonderful local restaurants (with Port Douglas only a short trip way), meld with the stunning location to offer a relaxed tropical holidays. A visit to Daintree village is enjoyable, and a good diversion for a coffee before heading back to the Daintree River ferry for the crossing to the Daintree Cape Tribulation Rainforest. Romance tinged with adventure – that’s the feeling you get as you cross the Daintree River by car ferry. The river crossing complete, take the winding road away from the river and into the depths of a magical place. The dense but precious rainforest encroaches the road itself, engulfing you in its chorus of mysterious sounds and a thousand shades of green. The Daintree hosts the largest collection of ancestral flowering plant families in the world. A Wet Tropics World Heritage area since 1988, the Daintree is a precious jewel in Australia’s environmental coffers; a delicate balance of interdependent ecosystems hosting an extraordinary collection of flora and fauna. The local Aboriginal tribe is the Kuku Yalanji people, who believe the creation of this area was the work of the rainbow serpent Kurriyala. Strange fungi glow in the dark, crocodiles frequent the mangroves and migratory birds flock here in the wet. Ulysses butterflies dance in the breeze, darting between this tree and that in search of something sweet. Stop at the Daintree Environmental Centre, where displays and tours offer an insight into this renowned environment. 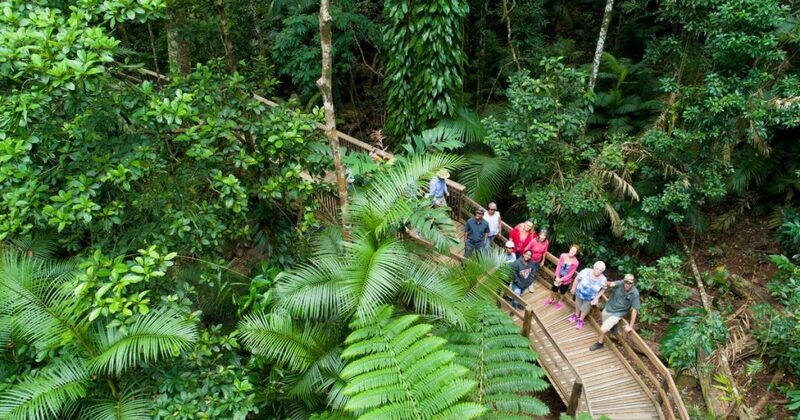 The boardwalk here is good, but the very best experience will come from a specialist tour such as Coopers Creek Wilderness, where a family operates insightful tours on their property on the banks of Coopers Creek. The Daintree Ice cream Company is definitely a great place to stop for a treat, and be sure to pick up some Daintree Tea (look for plantations as you drive along the main road). For the ultimate in rainforest relaxation, book a massage at the Daintree Natural Therapies and Day Spa, located in the Heritage lodge. Cape Tribulation village has some great galleries and cafes. From the area you can visit the Great Barrier Reef (boats leave from the north side of Cape Tribulation beach). Night crocodile spotting tours and horse rides are available at Cape Tribulation and of course, back at the Daintree River, river tours are very popular. The Bloomfield Track exemplifies the sense of adventure of the far north, where thick rainforest weaves its way up the coast to Cooktown and beyond. Access from Cape Tribulation to Cooktown is strictly for experienced four-wheel drivers but there are tours from Cape Tribulation that will take you up the Bloomfield Track. Peppers Bloomfield offers a luxury adventure with light plane transfers from Cairns. There is a popular misconception that winter (‘the dry’) is the only time to visit the Far North. On the contrary, ‘the wet’, as it is called (November/December to April/May), is the time to truly experience the rainforest at its best – the bird life alone is extraordinary and after intermittent heavy downpours, the sun bursts forth again and the rainforest sounds hit an amazing crescendo.